In the last blog post, I mentioned I had a hard time finding a followup to 2 really good books I read last month. After rejecting ever book in my library TBR pile, I started rummaging through the multiple TBR piles around my house. (Tell me I am not alone in that!) In stack #2, I found a copy of a book recommended to me by a student a few years ago for consideration for summer reading. I never got around to reading it because we selected other books, and it didn’t appeal to me at the time. Now? I love it. And by love it I mean I LOVE IT! 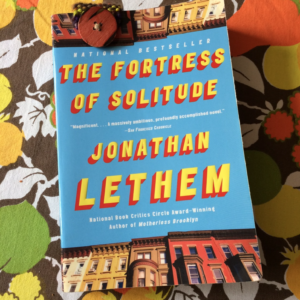 The Fortress of Solitude by Jonathan Letham is the The Adventures of Kavalier & Clay with magic realism, but it’s SO MUCH MORE. The story of Dylan Ebdus begins in 1970s Brooklyn, a white boy in a black neighborhood. Early on, his mother abandons the family, and he meets his neighbor, Mingus Rude, another motherless boy. The bulk of the book recounts Dylan’s school years, his friendship with Mingus, and their adventures as Aeroman after Dylan is gifted a magic ring by a homeless man. The first part of my review continues here. It links to the second part of the review. Share the post "Race with a Capital R"
Avid reader, fanatic knitter, monthly podcaster, and weekly blogger who happens to teach high school. Spontaneously Combusting Seniors – it could happen! Well, that sells me on it! Amen to that. Seriously, just mention Kavalier & Clay and take my money. Adding to the list! Loved this book! I always think of Nick Hornby’s fear of starting this book because the title seems too “pretentious and literary” before realizing it was a Superman reference. Ha – never heard that. I knew it was a Superman reference when I ordered it. Honestly, that made it more interesting to me! Sold! This sounds right up my alley.